All wrestlers above have profiles on Joshi City, you can click on their names to go straight to it. As I am watching the Samurai TV version of the show, some matches will be clipped. We kick things off with a battle between members of Jungle Assault Nation! Even though all four of these wrestlers are friends, friends still have to fight sometimes to find who the better fighter is. Kaori is the veteran of the group, with all the rest being “rookies” and/or children (in the case of Ruaka). A little different from the standard Stardom opener, but with a familiar theme as Ruaka and Leo look to get more experience. Leo and Natsuko attack from behind before the bell rings, they single out Kaori and Ruaka jumps on Kaori’s back as they all pose on her. So Ruaka isn’t the best teammate. Things settle down with Kaori and Leo in the ring and Kaori throws down Leo by the hair, Kaori stands on Leo’s shoulders in the corner and she hits a series of Mongolian Chops. Leo hits a scoop slam, cover by Leo but it gets a two count. Leo goes up top as Ruaka is in the ring, Natsuko comes in and she hits a spear on both Kaori and Ruaka. Diving crossbody by Leo to Ruaka, but it gets a two count. A cradle by Leo also gets a two as Kaori breaks it up, Natsuko returns but Kaori and Ruaka gain the advantage. Ruaka goes off the ropes and boots Leo in the face, but Leo barely gets a shoulder up on the cover. Fisherman Suplex Hold by Ruaka, and she picks up the three count! Kaori Yoneyama and Ruaka pick up the win. A basic match, and a bit clipped, but fine enough for an opener. From the little I have seen I like Leo a lot, she has a lot of energy and at least from the matches I’ve watched she seems pretty fluid in the ring. Obviously can’t get too excited about a clipped five minute match but the rookies are coming along pretty well. On paper this isn’t a particularly even match. Natsu Sumire joined Stardom last year and is a member of Oedo Tai, meaning she doesn’t mind doing whatever is necessary to win a match. Hanan is 13 years old and while she has a strong judo background, she still has a lot to learn in the art of professional wrestling. She has little chance of winning here but hopefully will learn a thing or two along the way. Hanan desperately wants a handshake before the match but Natsu refuses. Eventually Natsu relents but Hanan kicks her in the stomach, Hana goes off the ropes but Natsu does too and hits a jumping neck drop. Natsu picks up Hanan and puts her in the ropes before putting her in a choke hold, she lets go long enough to run off the ropes and boot Hanan in the back of the head. Natsu picks up Hanan and throws her into the corner, running elbow by Natsu and she delivers the Bronco Buster. Natsu gets her whip and hits Hanan repeatedly with it, but the referee finally grabs it, giving Hanan time to dropkick the whip out of the ring. Judo throw by Hanan and she dropkicks Natsu in the corner, STO by Hanan and she hits two more. Cradle by Hanan, but Natsu kicks out of the cover. Natsu gets Hanan’s back and applies a modified Dragon Sleeper before hitting a reverse DDT. Natsu picks up Hanan and delivers a modified Blockbuster Hold for the three count! Natsu Sumire is the winner. Poor 13 year old Hanan, once you take a Bronco Buster and get whipped in the ring I guess you are officially a pro wrestler. Hanan got in a few spots as one would hope but this was mostly the Natsu show. Natsu is not a high end wrestler, never has been and probably never will be, but her character is solid and she’ll have a place on Stardom’s midcard for the long term. A decent enough match but nothing that will stick in your brain for more than five minutes as it was pretty predictable and low level. Next up is Queen’s Quest vs. ShiKid! AZM and Konami were both drafted to Queen’s Quest in the spring, both are still young (particularly AZM) and slowly moving up the card in Stardom. Shiki Shibusawa is a 28 year old rookie, she hasn’t shown as much natural wrestling ability as some of the other rookies but still has time to grow. She teams with her friend and Future of Stardom Champion, Starlight Kid. Starlight Kid and AZM kick things off, Irish whip by AZM but Starlight Kid reverses it and they go through a fast exchange with Starlight Kid ending it with a dropkick. Shiki comes in the ring to help and they both dropkick AZM, double Irish whip to AZM but Konami runs in and helps AZM even the odds. AZM picks up Starlight Kid and tags Konami as they double team Starlight Kid in the corner, Konami snapmares Starlight Kid and kicks her hard in the back. Dropkick to the head by Konami and she covers Starlight Kid for two. AZM is tagged back in, scoop slam by AZM and she puts Starlight Kid in a camel clutch as Konami runs in to dropkick her. AZM goes off the ropes and hits a dropkick of her own, cover by AZM but Starlight Kid bridges out of it and hits a crossbody. AZM bridges out of that but Shiki immediately dropkicks her, Starlight Kid goes off the ropes and dropkicks AZM before hitting a standing moonsault for a two count. Shiki comes in again after AZM has tagged out, Tiger Feint Kick by Starlight Kid to Konami and she hits a Shiranui out of the corner. Missile dropkick by Shiki and she rolls up Konami, but AZM breaks up the cover. Shiki picks up Konami and goes off the ropes, but Konami quickly applies a Fujiwara Armbar. Starlight Kid breaks it up, AZM comes in and she kicks Starlight Kid in the head. Strike combination by Konami to Shiki and she hits a vertical suplex, AZM comes in and they both dropkick Shiki. Kick to the head by Konami, she flings Shiki to the mat and puts her in a seated armbar, making Shiki tap out! Queen’s Quest win! Our first gaijin battle of the night, as Deonna and Zoe take on Stars. Stars is basically the ‘home’ faction of Stardom, led by Mayu Iwatani, and here they are represented by the recently-returned Saki Kashima and everyone’s favorite wrestler Tam Nakano. Deonna has been in Stardom before as has the young Zoe Lucas, although this will be the last we see of Deonna in Stardom for awhile as she is rumored to have signed with WWE. Deonna and Saki start for their respective teams, Irish whip by Saki and she hits a springboard armdrag off the ropes. Deonna cartwheels over Saki and hits an armdrag, they both miss dropkicks before facing off again in the middle of the ring. They tag out, Zoe and Tam trade kick attempts until Zoe connects with one and drags Deonna back in. Double Irish whip to Tam and she eats a double flapjack, cover by Deonna but it gets two. Deonna goes off the ropes but Tam catches her with a kick to the head, she goes for a scoop slam but Deonna blocks it. Tam puts Deonna in position for a reverse DDT, Zoe tries to block it but Tam DDTs both of them for her trouble. Saki comes in, double Irish whip to the gaijin both are hit with Stunners. Saki and Tam go off the ropes and both hit dropkicks, Tam goes for a kick on Deonna but Deonna ducks it and knees Tam in the stomach. Side Russian Leg Sweep by Deonna and she goes for Tam’s arm, but Tam blocks it and kicks Deonna in the head. Deonna comes back with a head kick of her own, both wrestler tag out and Saki trades elbows with Zoe. Zoe throws Saki into the corner and delivers a running kick, scissors kick by Zoe but Tam breaks up the cover. Saki picks up Zoe and hits a bridging double underhook suplex, but Zoe gets a shoulder up. Saki picks up Zoe but Deonna comes in, Deonna picks up Saki and puts her in the Tree of Woe. Zoe dropkicks Saki while she is hung up, cover by Zoe but Saki kicks out. Zoe picks up Saki but Saki elbows her off, Unprettier by Saki and she picks up the three count! Saki Kashima and Tam Nakano are your winners. We are really flying through these first four matches, as we are only 30 minutes into the two hour broadcast. As with the first three matches, this was a short match that was clipped down further. The most noticeable thing to me here was that Zoe seems to have improved from the last time I saw her, her offense looked pretty crisp and she didn’t look out of place with the other wrestlers. They worked well together, although they could have clipped out any awkward moments, and for a five meeting airing they did as good a job as one could hope for. I can’t really recommend hunting down matches of this length/presentation but ok for a casual view. Even though it is not the main event, this is the match that everyone came to see. It was announced in May that Io Shirai had signed with WWE, and this is her farewell match in Stardom. For her farewell, she teams with her old best friend Mayu Iwatani to re-form Thunder Rock one last time. On the other side are members of Oedo Tai, the primary thorn in Io’s and Mayu’s side for the last couple years. Hazuki used to train under Io when they were in Queen’s Quest together so there is some additional history there, while Mayu and Kagetsu have been feuding since 2016. Io and Hazuki begin, Io pushes Hazuki into the ropes and gives a clean break, but Hazuki immediately locks back up with her. They trade headlocks and then elbows, Hazuki goes off the ropes but Io delivers a dropkick. Io picks up Hazuki and they reach a stalemate, leading to Io tagging in Mayu. Kagetsu is tagged in too, shoulderblock by Kagetsu to Mayu and she stomps her in the back when Mayu pancakes. Mayu tosses Kagetsu into the corner but Kagetsu avoids her charge, Mayu slides out to the apron however and kicks Kagetsu to the middle of the ring. She goes off the ropes but Hana trips her from the floor and pulls Mayu out of the ring. Mayu is thrown into some chairs as both teams battle around the ring and into the stands, Kagetsu and Mayu return after a moment along with Hazuki as they double team Mayu. Kagetsu picks up Mayu and spits water in her face, the referee complains but she spits water at him as well. She tags in Hazuki and Hazuki tosses down Mayu by the hair, bootscrapes by Hazuki but Io grabs her when she goes for the boot. Kagetsu pulls Io into the ring and throws her into the corner, leading to both Kagetsu and Hazuki hitting bootscrapes followed by running boots. Kagetsu and Hazuki double team Mayu before the referee manages to restore order, Hazuki slaps at Mayu and hits a few elbows, but Mayu sneaks in a Sling Blade and makes the hot tag to Io. Io hits a running elbow on Hazuki in the corner, double knee by Io but Hazuki fires back with a running elbow. Kagetsu comes in but Io flips away from both of them and hits a double dropkick, Kagetsu and Hazuki fall out of the ring and Io goes for a dive, but Kagetsu hits Io in the head with a metal plate as she goes for the move. Kagetsu and Hazuki bring Io and Mayu up into the crowd but Thunder Rock gain the advantage, Io gets up on the top of the balcony and hits a moonsault down onto Kagetsu and Hazuki. Io returns to the ring and Mayu slides in Hazuki, Tiger Feint Kick by Io and she delivers the swandive dropkick for a two count. Scoop slam by Io, she goes up top but Hazuki recovers and shakes the ropes so that Io falls into the Tree of Woe. Hazuki grabs Io and goes for the tombstone, Io reverses positions with her but Hazuki rolls out of it and hits the Codebreaker. Hazuki is up first and she slides out to the apron, hitting a swandive dropkick of her own for two. Hazuki tags in Kagetsu, kicks by Kagetsu to Io and she goes for the Ebisu Drop, but Io lands on her feet and hits an elbow. She goes for a double underhook facebuster but Kagetsu blocks it, palm thrust by Io and she hits a running double knee in the corner. Cover by Io, but it gets a two count. Io goes up for the moonsault but Natsu spits water on her from the apron, Kagetsu gets a metal sign and hits Mayu and Io with it. Kagetsu picks up Io and delivers a high kick, Ebisu Drop by Kagetsu and she covers Io, but the referee won’t count due to all the cheating. Kagetsu keeps cheating anyway as things completely break down, Io ends up in the corner and virtually the entire roster comes in to take turns attacking Io in the corner (or hugging her, depending on their preference). Mayu comes in and gets her turn too as she dropkicks her own partner and hits her with a standing moonsault. Cover by Kagetsu, but Mayu breaks it up. Kagetsu picks up Io but Io cradles her, Kagetsu muscles Io back up however and she hits a vertical suplex for two. Kagetsu grabs Io around the throat but Io reverses the chokeslam attempt into a hurricanrana, double underhook facebuster by Io and she covers Kagetsu for two. Io rolls to her corner and tags in Mayu, Mayu picks up Kagetsu and she delivers a kick combination followed by a standing crucifix bomb. Mayu goes up top but Hazuki runs in and suplexes Mayu back down to the mat, Hazuki and Kagetsu both grab Mayu but Io comes in with a swandive dropkick onto both of her opponents. Mayu picks up Kagetsu and superkicks her while Io hits palm thrusts, dragon suplex hold by Mayu but Hazuki breaks it up with a running senton. Hazuki then DDTs Io, Hazuki charges Kagetsu and Kagetsu catapults her onto Mayu for an assisted senton. Kagetsu elbows Mayu in the corner and Hazuki follows with a Codebreaker, Hazuki slams Mayu in front of the corner and Kagetsu nails the Oedo Coaster, but Io breaks up the cover. Hazuki charges Io but Io backdrops her out of the ring, she then dives out on Hazuki with a plancha suicida. Back in the ring, Mayu runs up the corner but loses her balance, so she jumps out onto the apron and kicks Hazuki from there instead. Back in the ring, Io goes up top and hits a missile dropkick, she then goes up top with Mayu and both of them hit stereo missile dropkicks. Cover by Mayu, but Kagetsu kicks out. Mayu picks up Kagetsu but Hazuki returns, Io grabs Hazuki however after some palm strikes as Mayu goes up top and they drop her with a spike tombstone piledriver. Mayu then grabs Kagetsu while Io goes up top and they give her a spike piledriver as well, Io goes to the turnbuckle again and delivers a moonsault. Mayu picks up Kagetsu from behind and nails her version of the dragon suplex hold, and she picks up the three count! Thunder Rock win! Even though Stardom has seven (!!!) titles, only one was defended on this event, as Momo accepts Kyona’s challenge for the Wonder of Stardom Championship. This is Stardom’s #2 title, as Kagetsu holds the World of Stardom Championship. Momo just won the championship on May 23rd against Io Shirai, and this is her first defense. Kyona is the leader of J.A.N. and has been wrestling for about 2.5 years, so she seems poised to finally stake her claim in Stardom. 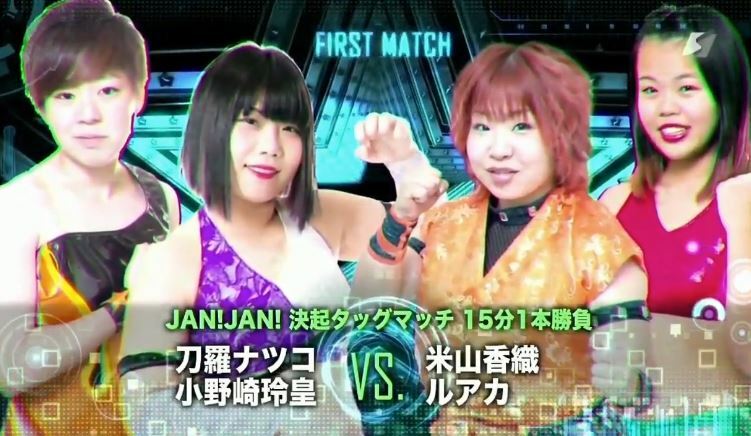 Even though Momo is only 18 years old she started wrestling when she was 15, and grew a lot when she was wrestling in Queen’s Quest with Io Shirai’s training. They charge each other as soon as the bell rings and Kyona hits a hard elbow, but Momo elbows her back and the two trade blows. Both wrestlers go off the ropes until Momo delivers a dropkick, Momo throws Kyona into the corner and dropkicks her again. Momo charges Kyona but Kyona hits a shoulderblock, Kyona picks up Momo but Momo slides away. Momo kicks Kyona in the leg and in the back repeatedly, kick to the chest by Momo but Kyona recovers and stomps Momo to the mat. Kyona wraps Momo’s leg around the bottom rope and starts twisting on it, she goes for a sliding elbow but Momo moves out of the way. Kicks by Momo but Kyona avoids one and dropkicks Momo in her injured leg, Irish whip by Kyona but Momo jumps on the second turnbuckle and delivers a dropkick. Kyona rolls out of the ring, Momo goes out to the apron and she kicks Kyona in the chest. She tries to do it again but Kyona lariats her in the leg, Kyona pulls Momo out to the floor but Momo blocks the powerbomb attempt and delivers the B Driver. Momo returns to the ring and waits for Kyona, but she gets tired of waiting and goes out to slide Kyona in. Momo picks up Kyona and goes for a second B Driver, but Kyona reverses it with a cradle. Momo dropkicks Kyona into the corner and hits a second one, snap vertical suplex by Momo and she covers Kyona for two. Momo goes off the ropes but Kyona catches her with a powerslam, she picks up Momo and goes off the ropes, but Momo greets her with a head kick. Kyona fires back with a lariat which leaves both women on the mat, Kyona recovers first and grabs Momo around the waist, but Momo wiggles away. Momo and Kyona trade elbows, Momo goes for a kick but Kyona catches it and powerbombs Momo. She keeps her grip on Momo and hits a second powerbomb, but Momo kicks out of the cover. Kyona goes off the ropes and goes for the sliding elbow, but Momo blocks it and hits a quick Somato. Momo picks up Kyona and goes off the ropes, elevated Somato by Momo but her cover gets a two count. Momo applies a crossface chicken wing, Kyona gets out of it however and she hits a short range lariat. Kyona goes off the ropes, Momo goes for a kick but Kyona ducks it and hits a German suplex. Kyona goes off the ropes and finally hits the sliding lariat, she hits another one to the back of Momo’s head and rolls her over for the cover, but Momo kicks out. Kyona goes up top but Momo elbows her before she can jump off, Momo joins Kyona but Kyona pushes her back down. Diving body press by Kyona, she rolls over Momo and grabs her around the waist, but Momo blocks the powerbomb attempt and delivers a hurricanrana. Lariat by Kyona in the corner but Momo catches her with a uranage. Momo picks up Kyona and kicks her in the chest, head kick by Momo and she delivers the B Driver. Momo picks up Kyona and goes for it again, this time from the turnbuckle, but Kyona slides off. Kyona charges Momo but Momo kicks her in the head and hits the diving Somato for two. Momo quickly applies the crossface chicken wing but Kyona gets back to her feet, Momo reverts the hold to a three-quarter nelson and nails the Tequila Sunrise for the three count! Momo Watanabe is still the champion! It is hard not to give a recommendation to an event with as much importance to Stardom as this one. In many ways the future looks bright for Stardom, as they build up Momo Watanabe and Jungle Kyona to go with established stars Kagetsu and Mayu Iwatani, but losing an Ace is always hard for any promotion. I think this show had a good balance of presenting the future stars while still celebrating Io Shirai, and it was the right move to give the title match the main event even if it wasn’t the match everyone came to see the most. Io’s farewell match was predictable but still very enjoyable, and nothing on the show was bad. Definitely worth tracking down, no MOTYCs here but still a fun event from top to bottom.